It can mean a lot to hold something in your hands. Consider the feeling of being a kid and holding a brand new card in your hands. Say it’s 1976 and the card shows a previously unseen (or even imagined) Technicolor eruption of colors virtually bursting from the two-dimensional limits of the card. That feeling is one I’ve been trying to describe on this site for a few years now, and it’s the feeling that is at the center of my book, due out in about a month. I just held the finished version of the book in my hands for the first time this past Friday, and it gave me a thrill like being eight years old and seeing the dazzling colors of the Houston Astros for the first time. For almost as long as I’ve been holding these cards in my hands, I’ve been wanting to write a book that, like the books that I’ve loved the most, such as The Basketball Diaries or Stop-Time or The Catcher in the Rye or On the Road or Jesus’ Son or This Boy’s Life or A Fan’s Notes, holds within its covers the story of a life. And in the years that I’ve been writing about my childhood baseball cards on this site, my primary aim has been to pass along the feeling of what it’s like to hold some kind of fleeting magic in your hands. The book, because of some great design work by my publisher, Seven Footer Press, has the look and even the feel of a brand new pack of baseball cards from the 1970s, and within the book are the color images of four packs worth of cards, the next best thing to me being able to hand you sixty of the gods of my childhood so that you too can hold them in your hands. I already made a link to this above, but in case you missed it, I’ve set up a page on this site with more information about the book, including where and when it can be purchased and what some people have been saying about it. Lest anyone be tempted to dream that a book called Cardboard Gods might mean that I’ll finally stop droning on incessantly about my childhood baseball cards on this site, please allow me to use this incredible Wayne Granger card to pass along the perhaps demoralizing news that I won’t be shutting up anytime soon, or perhaps ever, not counting debilitating medical problems or death. Put another way: I’ll never say it all, but I’ll keep trying. That’s the feeling I got when I first looked at this Wayne Granger card from 1976 this morning. I opened my shoebox full of cards and took the rubber band off of the stack of Astros cards, and this is the first card I saw upon opening the stack at random. I wanted to post something today that pointed toward this whole project of writing about all my childhood baseball cards, and I figured the Astros would be a good start, since their uniforms say so much about the strange woozy era I grew up in, and also about the hold it will always have on me as the time in which dizzying wonder roamed the land without a map or a compass or even a destination. Wayne Granger seems to feel it, too, leaning slightly to the left as if a little unsure of his moorings, a look on his face like his catcher is flashing him sign language interpretations of the essays of Umberto Eco. He has been a star in the league, back when things made more sense, back when he was on a team, the Reds, with strict rules about how to dress and how to wear your hair. Those years are behind him now. He has been traded for a player to be named later and has twice been afloat in the strange new ether of free agency. He can grow his hair long and put on vestments that could just have easily been the chosen garments of a 1970s cult dedicated to communal living, past-life regression hypnosis, and chanting at rainbows. 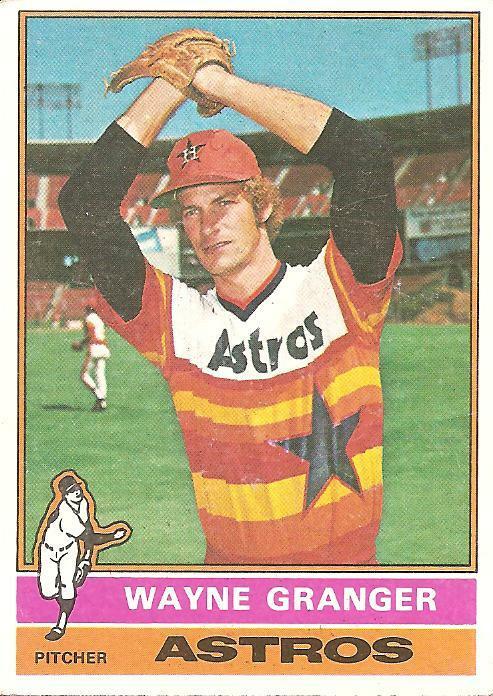 Granger (who because I was too young to know him as a star was always confused in my head with that early symbol of the excesses of free agency, Wayne Garland) carried a record of 34 and 35 into the 1976 season. He had not even had a baseball card in 1975, so there may have been some sense that this photo shoot might be his last. (It was, though after the Astros released him he did manage to hook on with the Montreal Expos and win one more game to even his all-time record forever at 35 and 35, perfectly even, a fact that affirms the conviction that I will never exhaust the great and small wonders of this era.) I wonder if he knew to be grateful for that feeling of holding something in his hands, a baseball inside a glove: childhood itself. That feeling ends for everyone eventually. Some of us keep trying to bring it back. You are currently browsing the archives for the Wayne Granger category.